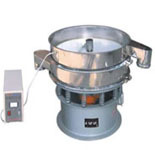 Information This type is applicable to filtrating liquid materials or manually-supplied powder ones . Information This type is applicable to filtrating special fine materials. This type consists of the sifters and supersonic, which is applicable to filtrating materials with static electricity, strong stickness and irregular shapes. The machine can be installed three layers max. The latest-designed frame can be designed to be removable, flanged and standard type.